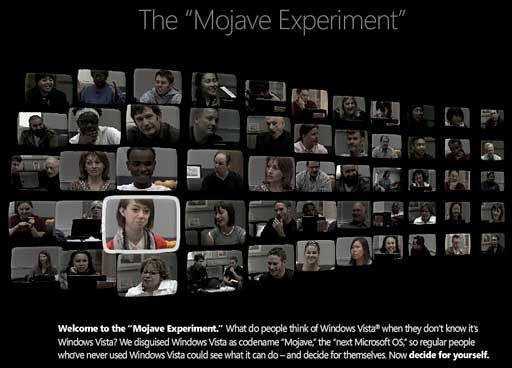 I heard the news about Microsoft's famous (infamous) Mojave Experiment. Microsoft tries to show how great Vista is by getting a bunch of people who don't know anything about Vista to give it a try. They told them that it was a new Windows operating system called "Mojave". I guess it was easy finding these people, because almost no one uses Vista today, even after 1-1/2 years on the market. Microsoft probably installed Vista on the fastest laptop they could find. Maybe they used a MacBook Pro: these are supposed to be fast at running Vista. They probably got a top-end Dell or HP notebook. Then they wowed the people they found "living under a rock" with how great it was. Since these people didn't know much about Vista, maybe they were Windows 95 holdouts and were easy to impress. The thing I like about the Mojave website is the fancy Flash video effects it uses. There are five rows of pictures showing the various video clips you can open. The rows tilt, and each clip magnifies as you pan over it. It's like a TV newsroom combined with special effects from the Mac OS X Dock. It got me thinking. This would be a good way to test how well your computer handles complicated websites. On my Mac Pro, I can pan across smoothly, and the effects are very fluid. When I switched to the Mac mini, it's more sluggish. Microsoft has invented a great way to benchmark your computer's browsing prowess. Maybe not what they were going for - but very effective results. It's the same thing with Vista. Vista is another software tool to measure just how slow and sluggish your computer really is. It's time to dump XP and buy a brand new computer. You current computer is a piece of crap, just install Vista and you'll see what I mean. You'll want a new computer before the week is over. Way to go, Microsoft, thanks for the great benchmark software.